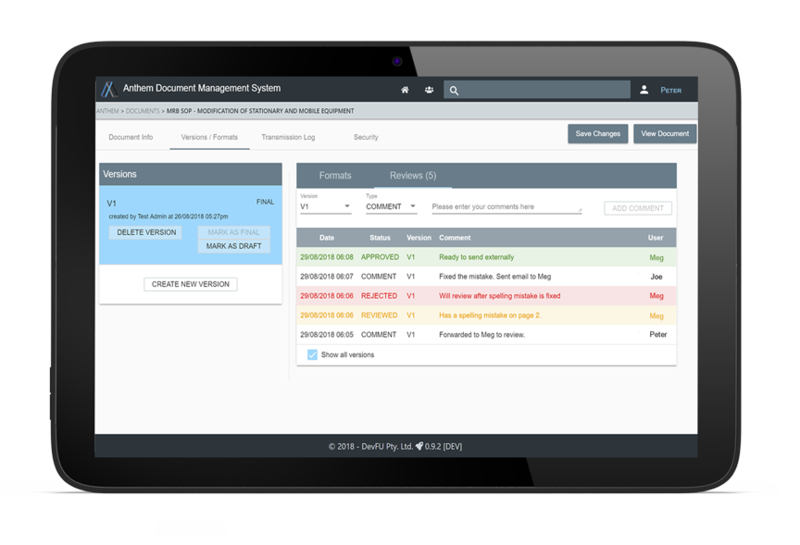 Anthem is a web-based, high-quality document control system that will automate the manual effort of tracking corporate documents and ensuring that historical documents are monitored and unchanged. Anthem uses version control and transmission logs to increase the level of security relating to document integrity. You have complete control over individual and group documents, to see when, how and by who a document was changed. Anthem will store any type of document and file, with previews currently available for documents with PDF or image files. Available for set-up on your own corporate server with our Enterprise Desktop Version, accessible for all your staff via the use of a VPN. Hosted on a dedicated Server at a secure data center with our Cloud-Based Options. All Versions of Anthem will include support packages and maintenance to ensure the system is effective and problem free. This removes the burden of software management from IT staff and users. To lay out documents in a logical and structured way, users of the system will be able to have multiple document maps called “atlases” so that they can have a personal atlas of documents that affect their role and group-wide atlases to be shared across the organisation along with the capability for department specific atlases. Atlases can be viewed in a standard grid view or a tree format similar to folders on a computer. Anthem uses a web-based interface that does not require the installation of any specialised software or plugins.Simply log in to anthem online and access documents on any device with an internet connection. Documents can have any number of versions stored with the latest finalised version being shown to users by default. Each document can consist of one or more formats. A single document can have a PDF copy and the original underlying document can be stored together in one place under the same version. The search interface will allow users to search for documents based on the terms in the title, description, or keywords of the document. In addition to this tags can be used for search terms so that document tags such as project ID's can be found easily. For PDFs and image-based documents, a preview will be provided to users within their browser to allow them to read the document without downloading it to their computer. Documents can be restricted to a particular collection of users or groups for reading or writing to ensure only appropriate people can view or update documents. The document atlas can be restricted in a similar fashion. Users can be created and be members of specific groups to restrict access for documents to particular groups. Manually record when a document is sent and communicated to a client. Add additional notes to these interactions to form a communication log so you know what version of a document people may have. 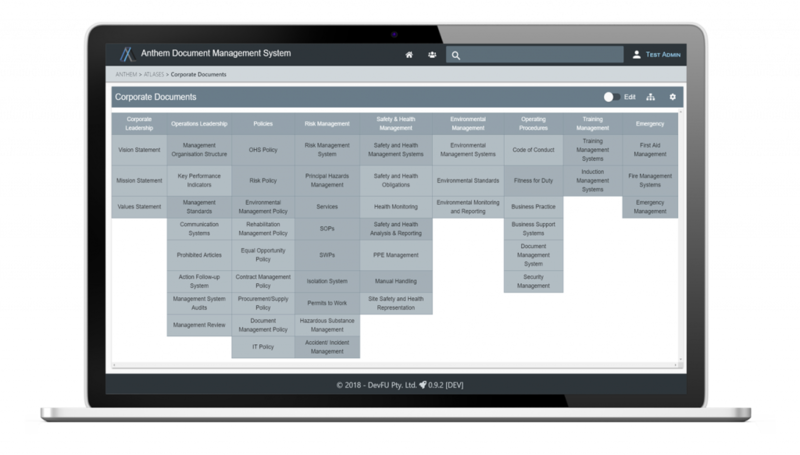 Anthem allows a user to manage the development and review process of corporate documents. Users can upload draft versions for review by other stakeholders who can then provide comments, approvals or a rejection status of that document. Drafts are hidden until its properly reviewed and approved by the right people. Anthem also manages expiry of documents so that users are aware of any lapsed documentation that may need revision.